For the past 51 years, St. Paul’s address has been 21 Hackett Boulevard, at the corner of an inconspicuous street called Samaritan Road. Samaritan Road is not much to look at now, but its name is the last reminder of the Good Samaritan Center, a group of Diocese of Albany institutions that once clustered along it. Between 1966 (when the Hackett Boulevard church was completed) and 1999, our building was paired with Child’s Hospital, the two buildings balanced on either side of Samaritan Road. When ground was broken for our building on July 26, 1964, you can see the then-new Child’s Hospital building directly to the west. To understand the significance of the hospital and the entire Center, however, we need to look farther back, because in many ways, the Good Samaritan Center was the recreation of an earlier complex of diocesan institutions created in the late 19th century by Bishop William Crosswell Doane on Elk Street near the Cathedral of All Saints. The Elk Street complex represented Bishop Doane’s plan for a cathedral with ancillary “institutions of learning and mercy that will gather about it.” This outgrowth of the social gospel was similar to the way in which his father, Bishop George Washington Doane, had surrounded his cathedral in Burlington, New Jersey with a group of institutions concerned with education and health care, particularly for the needy. Child’s Hospital’s name requires some explanation. You might reasonably think it was called Child’s because most of its clients were children, but that is not the case. Nor was it named for a wealthy Mr. or Mrs. Child who endowed it. No, Child’s Hospital was named for the order of Episcopal nuns who ran it from 1874 until 1949. The institutions that they managed on Elk Street near the cathedral were St. Agnes School (founded 1870), Child’s Hospital (founded 1874) and St. Margaret’s House for Babies (founded 1883). All of these institutions were located on the north side of Elk Street, between Hawk and Swan. When it was founded, Child’s Hospital was the only hospital for children between New York, Montreal, Boston and Buffalo. While it was affiliated with the Episcopal diocese, Child’s services were offered without regard to religious affiliation, and many services were offered free of charge. In addition to routine patients, Child’s Hospital also served children who needed long-term care for chronic conditions. If you grew up in Albany and remember the old Child’s Hospital, you probably also remember why you (or a sibling) were there. For Albany children in the first half of the twentieth century, Child’s Hospital was the place for tonsillectomy. In 1950, Child’s set a tonsil-pulling record: 102 pairs in a single month. The Sisters’ trio of institutions on the corner of Elk and Hawk began to break up in the 1930s. In 1932, with several of the buildings threatening to slide down into Sheridan Hollow, the diocese offered to sell all three buildings to the State. The State declined that offer, but St. Agnes’ School moved to Loudonville that same year, and St. Margaret’s House (by then known as St. Margaret’s House and Hospital for Babies) moved to the former Pest House (used by the city for isolating those with contagious diseases) in 1936. This site, located halfway between New Scotland Avenue and what is now Hackett Boulevard, would become the Good Samaritan Center campus. St. Margaret’s official mailing address was 100 New Scotland Avenue, but it was much more easily reached from an unpaved section of Hackett Boulevard. A rough path then led the visitor north up the incline. This rough path became Samaritan Road. Child’s Hospital, however, remained on Elk Street for another twenty years. The Sisterhood ran the hospital until Sister Lydia’s death in 1949. Bishop Oldham then brought the Order of St. Anne from Kingston; they administered the hospital until 1958. In 1959, the Episcopal diocese again offered to sell the property to the State to build a much-needed parking lot. The State accepted this offer, and the diocese closed the Elk Street building in summer 1959. The building was demolished in August 1960. With the closing of the last of the Elk Street institutions, Bishop Frederick L. Barry had a vision of a similar grouping of Episcopal institutions near the St. Margaret’s site. The location was selected both because it was near to St. Margaret’s, but also because the land was not settled and was easy to purchase. Before construction of the buildings, much of the land was used by squatters for garden plots. As described in the Knickerbocker News for February 4, 1960, pride of place for the Good Samaritan Center was to be given on the Hackett Blvd entrance to the new Child’s Hospital and a chapel. The remainder of the 17 acre complex was to include a home for the elderly, a nurses’ residence and possibly nursing school, an addition to St. Margaret’s House, an administration building, and possibly a doctor’s building. The first element to be built the Center was the new Child’s Hospital. This was accomplished speedily, and it received its first patient on October 23, 1961. For unknown reasons, plans for the chapel did not progress. This was all for the best for St. Paul’s, because in September 1962 New York State bluntly informed our vestry that the congregation would not be able to stay on Lancaster Street. The vestry chose to relocate to the proposed site of the chapel at the Samaritan Center. Over the next decade, other elements were added to the center: Nelson House (the home for the “well aged”), the Child’s Nursing Home, additions to St. Margaret’s House and a doctor’s building. St. Paul’s and Child’s Hospital were Episcopal partners, siblings on Hackett Boulevard for our first 33 years on Samaritan Road. The Diocese of Albany sold Child’s Hospital in 1999, and it became the Albany Medical Center South Clinical Campus. 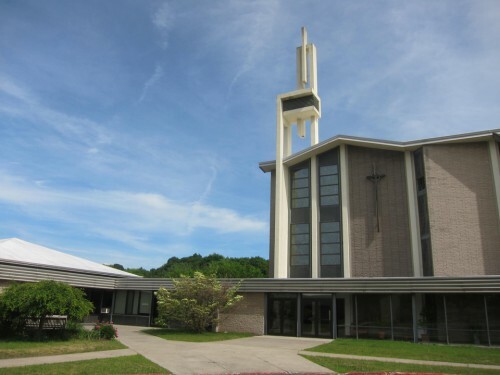 The profits from that sale (over 10 million dollars) went to create Episcopal Charities of Albany Inc., which now provides “health care services and health care-related educational and religious programs” at the Spiritual Life Center in Washington County. St. Margaret’s still sits on Samaritan Road, although it has long since become an independent institution. The diocese’s sale of Nelson House to the Albany College of Pharmacy in 2003 leaves only the street name to remind us of the Center. Perhaps we should change St. Paul’s address to 1 Samaritan Road as an appropriate nod to our history, and to the history of a laudable diocesan effort. This entry was posted in Hackett Blvd Building, Other Episcopal Organizations on February 24, 2017 by Paul Nance.